ofd performed this live remix set on the main stage. ofd performed a 1-hour live remix set. ofd demo'ed the latest iteration of his remix ←→ culture blue box. ofd was invited to feature his remix ←→ culture blue box for audience members to play with. ofd played piano in a Brazilian jazz trio, led by Jascha Hoffman. ofd was one of 4 DJs to rock an all-night private dance party. ofd blasted an upbeat laptop dj set. ofd played guitars and electronics with his band Odds of Survival for the release party of their debut album "You Will Be Rescued." ofd played wurlitzer electric piano in a Brazilian jazz duo led by Jascha Hoffman in a kitchen overflowing with music afficionados. ofd played rotating DJ sets with supercat. ofd played two hour-long live sets, including 1 hour of all-new audio-visual remixes of Moroccan sights and sounds collected for his remix ←→ culture non-profit initiative at this false profit event. ofd was one of a dozen DJs (including celebrity DJ Ill Gates) to rock an all-night private new year's eve party for hundreds of San Franciscans. recently back in the US after a multi-month trip to Morocco, ofd performed his most danceable, rockin DJ set to date, which later turned into a studio mix he released as ofd turns it up. ofd demo'ed the latest iteration of his remix ←→ culture blue box at his alma mater. ofd performed a 30-min live improv audio-visual remix using the first iteration of his remix ←→ culture blue box. Later in the evening, he performed with Shawn Feeney and David Horn in a surprise reunion of their college free-improv trio “The Magic Number”. ofd gave san franciscans a taste of the upbeat laptop dj set he had recently played in the desert. ofd played rotating DJ sets with supercatfor a crowd of Fourth of Juplaya revelers in the open desert. ofd's very first remix ←→ culture blue boxwas featured as an installation for priceless attendees to play with throughout the 3-day event. ofd performed a mid-tempo laptop dj set for this semiannual event featuring the ucsf brewers’ guild’s finest winter ales. ofd ripped the dancefloor with a laptop dj set to celebrate mark mian's birthday and return from thaliand, in preparation for his first muay thai tournament. ofd later released a version of this mix as ofd occupies cash flow. ofd blasted an upbeat laptop dj set full of mashed-up north african music. ofd performed a chill laptop dj set, which later turned into a studio mix he released as ofd puts your rubbers on his feet. 07/17/10 the revolution cafe san francisco odds of survival's first live show at a “real” venue. 07/15/10 scott roy’s apartment san francisco ofd’s first public appearance performing solely on ipad. he recorded sounds from the audience before his performance, and then began playing those sounds through effects using the Looptastic app, before dropping some serious beats. 07/04/10 sugar magnolia san francisco odds of survival's very first live show. 12/13/09 counterpulse san francisco ofd contributed original music and performative photography in this collaboration with dancer / choreographer alyssa lee wilmot (aka group A). 11/15/09 langton labs san francisco at the start of the challenge, each dj contestant had to download the same folder of music files, and - within 2 hours - create a cohesive remix track out of those sound sources. ofd teamed up with Supercat! with delicious results. ofd's photo montage was projected behind dancers in this collaboration between alyssa lee wilmot (choreography, dance), thom blum (sound) and ofd (photos, videography). 07/26/09 blue sparrow san francisco ofd sat down with shawn feeney for an improvised acoustic guitar duo with dancers. ofd performed a never-to-be heard again bumpin’ live set. ofd played a 45min live set of all-new original lazer-pounding bass n beats at this weekly False Profit event. This was ofd’s first attempt at performing a live “dj” set that people can “dance” to...with their bodies, that is, not just with their minds...But don’t get too excited, I’m not making house music (yet...). It’s still pretty kablamo-ridonculous. But I have proof that people can and WILL dance to it, as they did at this secret affair on Saturday night in San Francisco called “Danceclub”. Yeah, it’s like Fight Club, except replace “Fight” with “Dance” and remove the space. 05/07/07 grant & green san francisco ofd played live keys (rhodes) with drummer ryan dylla. they called themselves “duck duck moose”. 10/29/06 green tortoise san francisco ofd’s first solo laptop performance in san francisco. 07/19/06 bar 25 berlin ofd didn’t realize he had fans in berlin until he went there and saw for himself. the second truly solo ofd show blended pre-programmed sequences and live processed acoustic guitar+event title '11/12/05'. This first truly solo ofd show blended pre-programmed sequences and live processed vocals and guitar, with a dash of lip-syncing. john zorn’s improvisational game piece takes on new life on this most deathly of nights. a 30-minute collage of classic horror moments is projected onto a wall behind the 12-piece ensemble. the musicians are therefore not privy to the visuals displayed for the prompter and audience. the task for the tag-team of prompters is to take turns educing a soundtrack out of these unseeing musicians. cobra + rock club = grindcore. watch out! brandon wants your hairdo. The free beer provided at this show was intended for the audience. but the musicians drank the bulk of it. with hilarious results! was bossa nova ever meant to sound this way? Cobra + rock club = funky funk. The monthly series at the church of the friendly ghost shifts to incorporate not only zorn's cobra, but improv game pieces by members of the ensemble as well. farewell performance for cobra provocateur shawn feeney. featured the premiere of new improv pieces by adam sultan (5 card draw) and shawn feeney (raw shack). 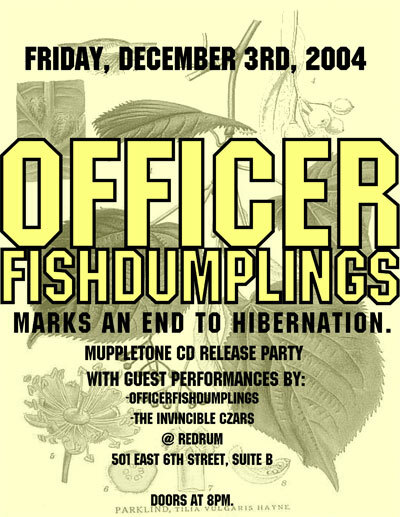 The last ooblek (Shawn Feeney & officerfishdumplings) performance in Austin. Laptops, guitars and cybernetic beatboxing. Other acts included: New Berlin, Malcom Kipe, Dreamtigers, Ghislain Poirier. 06/28/04 church of the friendly ghost austin the third in the monthly cobra series. the farewell cobra for local electronic musician bill thompson. featured ofd, mehdi boudra, shawn feeney, holland hopson, philip moody, chris petkus, aaryn russell, adam sultan, bill thompson, travis weller, and brandon young. The second in the monthly cobra series. 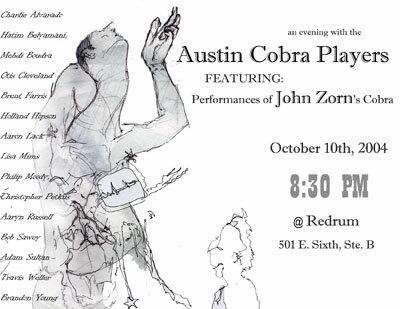 over a dozen of austin’s finest improvisers performed john zorn’s most popular improvisational game piece, cobra, using an array of cue cards and hand signals. a sonic odyssey of dramatic jump-cuts, virtuosic noise and serendipitous beauty. featured ofd, mehdi boudra, otis cleveland, brent fariss, aaron lack, philip moody, chris petkus, aaryn russell, bob sawey, adam sultan, bill thompson, travis weller and brandon young. The first in a series of performances the last Sunday of every month at the church of the friendly ghost. a talented and eclectic group of local improvisers performed john zorn’s infamous improvisational game piece, cobra. Featured ofd, mehdi boudra, meera chandy, otis cleveland, brent farriss, shawn feeney, aaron lack, aaryn russell, bob sawey, adam sultan, bill thompson, brandon young. 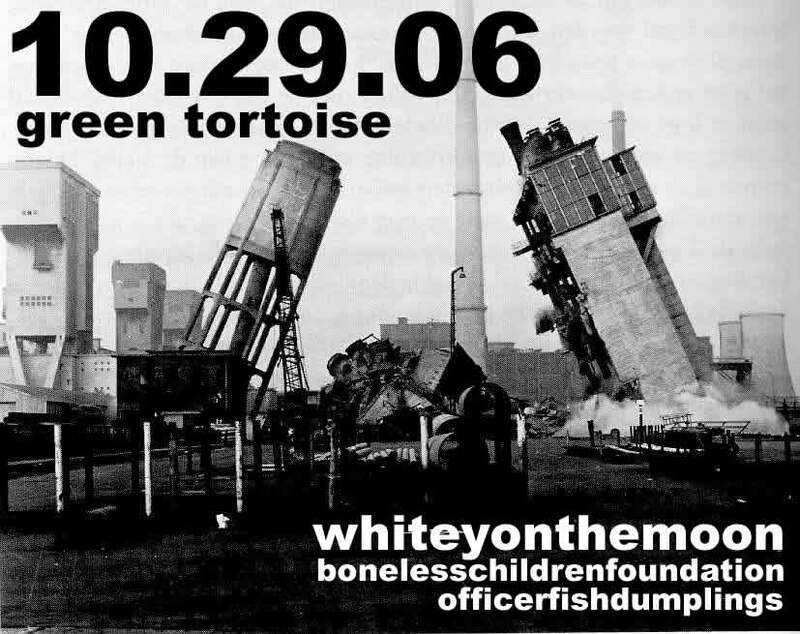 03/25/04 the parish austin ooblek (ofd & shawn feeney) performed with pedal, inkblot, tuxedo killers, and the octopus project, part of the notenuf records showcase. 03/09/04 church of the friendly ghost austin The Austin Cobra Players a workshop of john zorn's infamous improv game piece, Cobra. 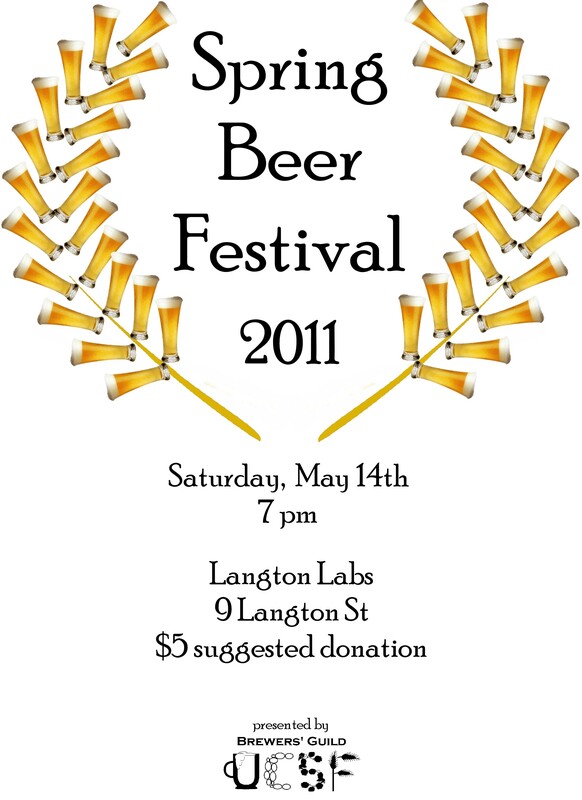 organized by shawn feeney with some of austin's finest improvisers. 09/27/03 the vortex austin the inaugural event of supplemen+, a not-for-profit organization dedicated to providing unique experiences through the intersection of various art forms. Bringing cultural health care to Austin with music, visual art, installations and performance. Co-curated by ofd, featured live music by ooblek, holland hopson, kurt korthals & kurt newman , and the ronnie dobbs trio. 09/19/03 kvrx 91.7 fm austin ooblek live in your bedroom via the magic of radio. streaming audio on the web at www.kvrx.org. a long-distance, simultaneous intermedia performance, a duet between countries. shawn feeney performed in auckland with rachel shearer (lovely midget - visuals) as ofd performed with adrian taylor (visuals) at the same time in Austin. a realtime multiuser web interface created by shawn generated visuals from the midi (electronic music) info sent from the opposing location. the visuals were then interpreted as an animated graphic score, creating a feedback loop between the visuals, music and performers. 03/26/03 house concert austin ooblek performed an electro-acoustic set featuring guitars, doumbek and bucketfuls of signal processing, all set on a concrete slab. this show marked the birth of ooblek and premiered shawn feeney's video duet no. 1 (an animated score) along with the "shawn feeney vs. officerfishdumplings" flash interface. two mice were connected to a laptop projected onto a screen. the performers could control/influence each other's performance by clicking various icons. set also included a duet for processed doumbek and computer keyboard. Collaboration with shawn feeney, installed for Airspace (the stairwell of Artspace). each collaborator's contribution plays from a separate cd player, gradually drifting out of synchronization throughout the duration of the installation. curated by andrew clifford.